Ruby Gemstones - Real Facts, Information, Advice & Myths ? Ruby gemstones, for thousands of years, have been considered one of the most precious and valuable gemstones on planet Earth. Ruby gemstone. The gem of passion and power. The stone of love and vitality. This most precious gemstone has ruled the world of gemstones since ancient times. Ruby, the July birthstone jewelry makes a great 5th and 40th anniversary gift . Ruby is the red variety of the mineral corundum, the second hardest natural mineral known to mankind after a diamond. Corundum of any other color - be it blue, yellow , green etc - is called a sapphire. Ruby is also the capricorn zodiac birthstone. Rubies range from pink to blood red. Some rubies can also have a brownish or purplish tint. Rubies get their red color from the amount of chromium and iron in the stone. The most desirable color is the so-called "pigeon's blood" or the "burmese ruby color" a pure red with a hint of blue. Unless specifically advised , yhou should always go with the assumption that some kind of enhancement or heat treatment is involved nowadays with the ruby. The most common treatment for ruby is heat treatment. Stones, generally before they are cut, are subjected to high heat temperatures (1700 to 1800 degrees Celsius ,3100-3300 degrees F) and controlled cooling to improve both color and clarity. The general view at present seems to be that simple heating, being indistinguishable from Nature's own heating processes, is acceptable -- as long as it is disclosed A reputable dealer will always disclose gem treatments. The most important feature of a ruby is its color, transparency being of secondary importance. Inclusions are common in a ruby and do not impair the quality of a ruby unless they decrease the transparency of the stone or are located right in the centre. On the contrary: inclusions within a ruby could be said to be its 'fingerprint', a statement of its individuality and, at the same time, proof of its genuineness and natural origin. The cut of a ruby is quite important. Normally good quality rubies have step or brilliant cut while ruby stones of a lesser quality are cut in cabochon. Large, high-quality, natural rubies are very rare and expensive and should be accompanied by a report from a qualified gem lab that certifies their autenticity. Ruby is the birthstone of july and considered to represent devotion, desire and passion . The gift of a ruby symbolizes evelasting love. Some say that if a ruby ring is worn on the left hand it will bring its wearer good fortune. Many others believe that those who possess the ruby will live a peaceful and harmonious life. In the Sanskrit language, ruby gemstones are called the "ratnaraj" meaning "king of gemstones." Ancient Hindus believed that it was the lord of all ems. Hindu mythology states that ruby is a "navagraha" stone, and represents the planets that have influence over our lives. The healing powers of the ruby gem remains a very controversial issue. I personally don't know whether its a fact or fiction but the common belief is that wearing it in close contact with the skin help in backache and toenail problems. Ruby gemstones is said to accord wearers wisdom, happiness and health, and to bring particularly good luck to gamblers ( now don't go running off to the casino) and lovers. 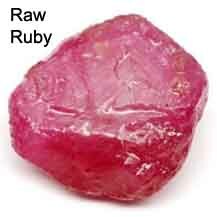 When rubbed on the skin ruby gemstones is thought to restore youth and vitality. In the Middle Ages, the ruby was viewed as a stone of prophecy - people believed it would darken when its wearer was in danger. 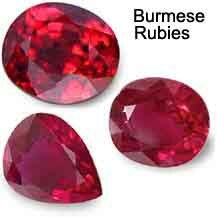 Burma, now known as Myanmar, is the most well-known source of fine rubies. Ruby production is Thailand is declining and is now mainly a center for processing and trading gems. Madagascar is now one of the world's leading ruby producers. Other quality rubies can also be found in India, Sri Lanka, Australia, Kenya, Tanzania, Afghanistan, Pakistan, and the United States.